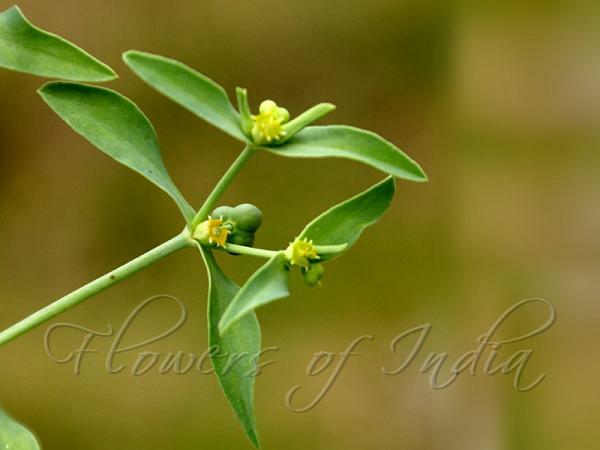 Dragon Spurge is an annual or short-lived perennial herb, growing to 10-40 cm tall. 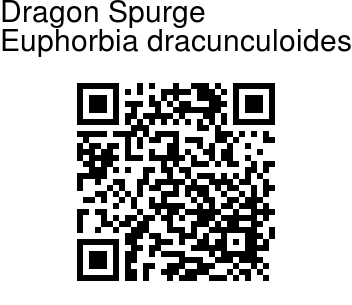 The species name dracunculoides means resembling a small dragon. Stem, 3-7 mm thick, are sometimes branched from below. Alternately arranged leaves are linearly-oblong, 1-3 cm × 2.5-4 mm, with almost no stalk. Leaf tips are rounded or blunt. Floral leaves are broader. Inflorescence is an inconspicuous terminal few-rayed cyathium. Flowers are borne inside a bell-shaped cone of bracts, within a pair of floral leaves. Flowering: May-September. Photographed at Tikkar lake, Morni, Haryana.